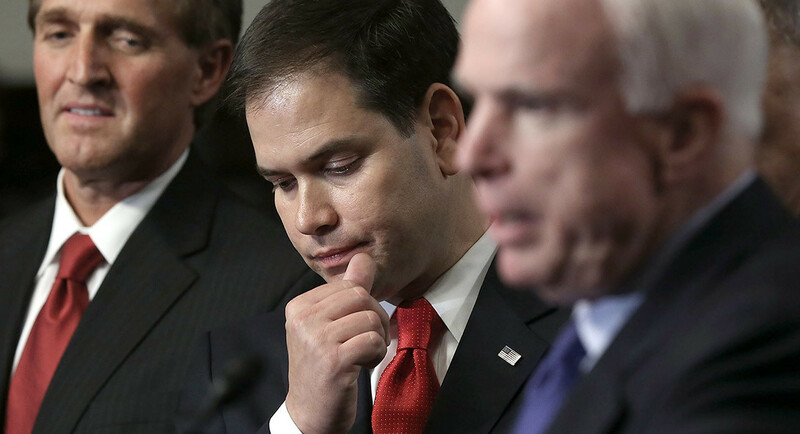 More than 1/2 of Marco Rubio's GOP Senate colleagues signed on for a mega-fundraiser for the off-again/on-again re-election campaign for the Florida Senator; neither John McCain nor Jeff Flake stood up for their on-again/off-again Gang Of Eight immigration reform buddy. The D.C. fundraiser took place Wednesday night, after Rubio changed his mind last week and decided to re-run for his Senate seat. He was one of the Final Four candidates to fall to Small Hands Trump in the Presidential nomination cage match, and had pledged to pivot to private life. Don Stapley is the first candidate advertising on Phoenix TV in the crowded race to replace Rep. Matt Salmon (R-CD5). While State Senate Majority Leader Andy Biggs has the largest warchest, Stapley - a former Maricopa County Supervisor - is the first to go live, stressing his experience. The $15,000 two-week ad flight is titled "Stapley's Experience", and begins airing today. I'm Don stapley and I approve this message. The U.S. Chamber of Commerce* today begins running another flight of ads supporting Arizona Senator John McCain, this one featuring Arizona Diamondback legend Luis Gonzalez. The one-week ad buy in Phoenix and Tucson totals $540,000. Gonzalez - who is the Senior Advisor to the Diamondbacks' President & CEO Derrick Hall - lauds the longtime Senator/season ticket holder/part owner, calling him a "fighter". Interestingly, the 30-second ad indicates that it is "Sponsored by the Arizona Chamber of Commerce & Industry", but is paid for by the U.S. Chamber. Neither organization discloses its donors and both are classified as "dark money" spenders. The ad begins airing in Tucson today, and will run through the 29th. The $175,000 plunked down for Tucson airtime is more than the Chambers spent last month on a flight in Tucson. This time, the Chamber will also air the spot in Phoenix. Ken Kendrick - the Arizona Diamondbacks' Managing General Partner - and his wife Randy are major GOP and GOP-related (including McCain) donors. *The U.S. Chamber is one of the original dark money operations; it does not disclose donors for particular ad campaigns (or, in general). The University of Arizona and Arizona State University continued their ongoing rivalry on the Twitter field today. Subject: License Plates. ASU sent out a tweet boasting about hitting "18,000+ (Sun Devil license) plates on Arizona Roadways (sic)" and asking "have you gotten your Sparky plates?" UA responded with a blasé "Nah." Sparky's handlers got the last laugh (so far), with their equally-casual "Well...it's never too late to upgrade to them from whatever you have. For the record, the most recent statistice released from the Arizona Department of Transportation shows that UA plates earned $102,000 more from the license plates than did ASU in 2015. ($398k to $296k). ASU has more students and alumni, but there are still more UA cars bearing down on you. The federal Department of Health and Human Services (HHS) yesterday announced $2.9M in oral health grants to 7 Arizona health centers. The monies are part of a 5-year, $11B effort under the Affordable Care Act (aka Obamacare) to support health centers for medically-underserved communities. HHS distributed $156M in oral health funds yesterday to health centers in 47 states (plus DC and Puerto Rico). These nonprofit community health centers provide a variety of services to uninsured and underinsured persons. Several of the grantees have multiple service locations in the Phoenix and Tucson areas, and the others are based in Page and Yuma. Yavapai County was the 7th recipient. The complete list is below, and more information on the grants can be found here. No word yet from the centers on how many dental providers will be hired, although HHS thinks about 1,600 will be hired nationally. Nor is there information on whether the grants are one-time awards or continuing. For more information on Arizona's Community Health Centers, click here. The Arizona Supreme Court today unanimously upheld the death sentence for Mark Goudeau, the Baseline Killer. Goudeau was convicted on 9 1st degree murder counts (and 67 charges overall). The 76 page opinion (below) considered 16 separate appealable issues stemming from the arrest through the sentencing process and including DNA, right to counsel, waiver of mitigation (and more). The 9 murders took place in 2005 and 2006, and the search for the so-called Baseline Killer received much public attention at the time. In January, Arizona Governor Doug Ducey and all seven Republican members of Arizona's Congressional delegation announced a coordinated effort to split the U.S. 9th Circuit Court of Appeals in two. The effort apparently ended that week, as the bills die a slow death (in a Congress full of slowly-dying measures). Sen. Jeff Flake and Rep. Matt Salmon each introduced an identical bill to create a new 12th Circuit to include Arizona, Alaska, Idaho, Montana and Nevada. Arizona's other Republicans co-sponsored the measures. Since then, neither bill has added any co-sponsors or received a committee hearing. Before the AZ GOP effort, the Supreme Court had affirmed 9th Circuit decisions regarding Arizona's anti-illegal immigration SB1070 law and Republicans' efforts to overturn the state's independent redistricting. And, after the effort began (and, apparently ended), the Supreme Court UNANIMOUSLY affirmed the 9th Circuit's decision turning away a 2nd GOP challenge to Arizona's redistricting. Side note: It is interesting to re-read Ducey's (misleading) comments about the "overburdened" 9th Circuit in light of his successful effort to add two Justices to the "overburdened" Arizona Supreme Court. Perhaps taking a page out of Donald Trump's playbook*, Maricopa County Sheriff Joe Arpaio's sometime-attorney is going on the PR (and legal) attack against the U.S. District Court Judge who is holding Arpaio in civil contempt of court and is on the verge of referring him for a criminal contempt investigation. Larry Klayman - who is representing MCSO informant Dennis Montgomery - says Judge G. Murray Snow "thinks and acts like the fascist Italian dictator Benito Mussoulini", and that last week's court proceedings were "a modern-day lynching by a federal judge. He points out that the Italians' WWII leader ended up killed and hanging, while claiming "I firmly do not advocate this for Judge Snow, as I do not believe in violence." The Klayman column was published Friday on longtime Klayman/Arpaio ally wnd.net under the headline "'Il Duce' Judge Out To Destroy Sheriff Joe". Klayman indicates that the 9th Circuit Court of Appeals will be reviewing the "jurists' (sic) outrageous misconduct concerning my client Dennis Montgomery", and says that the Judge's threats prompted Arpaio and Maricopa County attorneys to "unethically (seek) to protect their own derrieres." Klayman represented Arpaio in his unsuccessful legal action against President Barack Obama, attempting to overturn executive actions regarding illegal immigration. Klayman inexplicably uses the present tense, although the Supreme Court flatly denied Klayman and Arpaio not once, but twice. Arpaio and former Arizona Governor Jan Brewer are prominent Donald Trump surrogates and supporters. Brewer today touched off a Trump campaign brouhaha when she told Trump on a conference call that his campaign had instructed her and other surrogates to not speak about the inflammatory Trump University case and the presumptive nominees comments about the judge. Trump told Brewer and the others to ignore his staff's email and to echo his anti-Curiel comments (and to call reporters racist for asking questions). Perhaps Brewer can also intervene with Sheriff Joe and Larry Klayman. h/t to Seeing Red Arizona for seeing and bringing our attention to the Klayman column.